With the New Year already off to such a great start, we’re so excited to share dozens of fresh ideas for your date nights in 2019! There will be a plethora of new restaurants coming to town, as well as live shows and experiences, new resorts for romantic staycations, and of course some new theme park attractions. Here are the best new ways to do date night in Orlando in 2019. Disney Springs is set to introduce a few new restaurants this year. Open since late November 2018, Wolfgang Puck Bar & Grill has something to please every palate, from Mediterranean cuisine to southern comfort food. Opening later this year, City Works Eatery and Pour House is a spot you’ll want to add to your date night bucket list. There will be an impressive selection of 80 beers on tap, plus tons of options for shareable plates. Look out for the grand opening sometime this summer. Next, Disney Springs will be getting its own location of Jaleo by José Andrés. This will be the biggest of the six Jaleo locations, featuring a mix of traditional and innovative Spanish cuisine. We’re especially excited about the variety of wood-fired paellas. The masterminds behind The Sanctum Cafe are bringing more innovative and scrumptious plant-based food to Orlando this year with TWO new restaurants. The new high-end concept, Proper & Wild, will be located on Morse Avenue, just steps from Park Avenue in Winter Park. Also coming soon is The Sanctum Coffee and Juice Bar in Altamonte, a grab & go style eatery featuring Sanctum favorites plus locally roasted coffee and espresso, signature drinks, smoothies, juices and more. Á La Cart Orlando is one of our favorite new date night spots! Husband and wife team Dustin and April Williams just opened the Milk District’s new mini food truck park, which has indoor and outdoor space, plus a craft beer and wine bar. It’s kid-friendly if you want to do date night with your kids. Gene Simmons and Paul Stanley of KISS have opened Rock & Brews at SunsetWalk at Margaritaville Resort Orlando. Innovative American comfort food and craft beer come together to offer an exciting dining experience sure to rock any date night. This is the third Central Florida location of the restaurant chain. More dinner date spots we’re excited about this year include: Tre Bambine Italian Kitchen near Lake Eola; the New England-inspired East Hampton Bait & Tackle, which is taking over the former TR Fire Grill space in Winter Park; The New York-inspired Hampton Social and Austin-based Hopdoddy Burger Bar coming to Pointe Orlando; Kona Poké, a healthy fast-casual eatery coming to Lake Mary; and Sette, a rustic Italian concept by the owners of Se7en Bites. This fall, Disney’s Hollywood Studios will unveil Star Wars: Galaxy’s Edge, the highly-anticipated and immersive Star Wars land. Star Wars fans can look forward to two new attractions (Millennium Falcon: Smugglers Run and Star Wars: Rise of the Resistance), themed dining and shopping, and more. Harry Potter fans won’t want to miss the brand new roller coaster coming to the Wizarding World of Harry Potter – Hogsmeade at Universal’s Islands of Adventure in 2019. 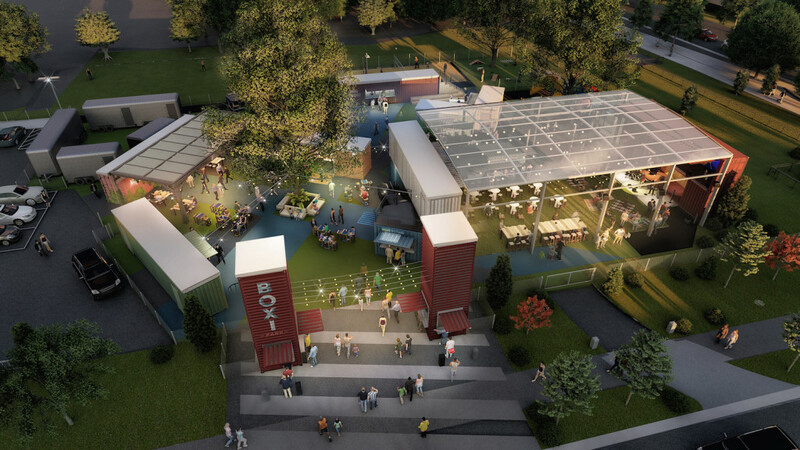 We can’t wait for the opening of Boxi Park in Lake Nona (pictured in feature image). Constructed out of old shipping containers, this entertainment hub will house restaurants, bars, space for live entertainment, and even a beach volleyball court. The open-air layout will make for a laid-back space to connect on a casual date night, with something sure to please every couple. Sports fans, listen to this one: this summer, The NBA Experience will be opening at Disney Springs. Get ready to make all of your courtside date night dreams come true! Expect immersive experiences and games, an NBA retail store, and more. Wild Florida Airboats & Gator Park is opening a drive-through safari park this summer. Adventurous couples can travel along gravel paths in their own car, or hop on a swamp buggy to see over 100 exotic animals in Florida’s natural habitat. Margaritaville Resort Orlando will be the perfect vacation destination for Parrotheads. Get in the Jimmy Buffet signature state of mind with a blue lagoon pool, tropical cocktails, a luxurious spa, a waterpark, and Sunset Walk – a shopping, dining, and entertainment district. Disney Vacation Club will be opening their 15th resort this winter. Expected to open in the fall, Disney’s Riviera Resort will feature stunning design inspired by Europe’s Mediterranean coast and will have a perfect view of nightly fireworks shows. The resort will also boast immediate access to the Disney Skyliner, a new gondola transportation system that will link Disney’s Hollywood Studios, Epcot, Disney’s Art of Animation Resort, Disney’s Pop Century Resort, Disney’s Caribbean Beach Resort and Disney’s Riviera Resort. Universal will also be getting some new weekend getaway spots. The Surfside Inn and Suites is planned to open this summer as a part of Universal’s Endless Summer Resort, and it’s set to be one of Universal’s more affordable options.